From Offshore to Land-based, PAGASYS Offers the Reliability and Dependability You Can Trust. ECHO Digital intercom and communication systems provide addressable intercom, public address, general alarm, paging and telecommunication capabilities. A single ECHO system can provide the same level of safety, coverage and reliability normally achieved with multiple systems. Overcoming Mechanical Failures in Industrial Horns and Sounders. Federal Signal Integrated Systems Division is a leading supplier of communication and security equipment for offshore, LNG and marine markets. Our product offering includes public address/general alarm systems, hazardous location and safe area intercoms and paging systems, audible and visual signals, telephony, security solutions, fire/ems products and lightbars for your security vehicles. In addition to products, our team is totally committed to responding to customer demand for value-added engineering and design services. Their specialized expertise in hazardous location, telecommunications, fiber optics and radio communication networks translate into cost-effective system designs and productive solutions for a broad scope of applications and emergency signaling requirements. Having an emergency notification system is important. 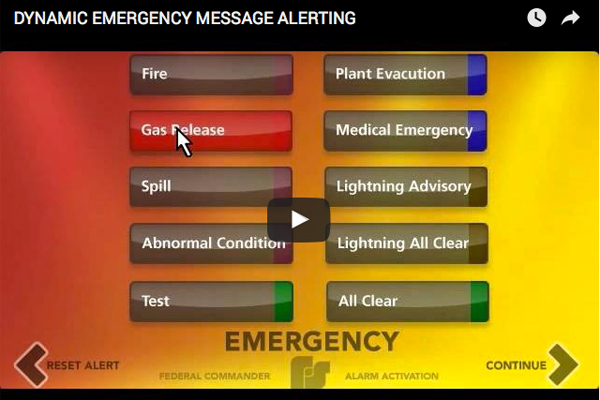 Having the right multi-layered emergency notification system is critical to people’s safety, protection of property, surrounding communities and your operation’s continuity. Numerous disparate systems can be a challenge when notifying the right people at the right time with the right message. Federal Signal’s CommanderAssist™, a single on-premise platform for all critical communications, can help protect life and property, meet regulatory requirements, and improve operational efficiencies.